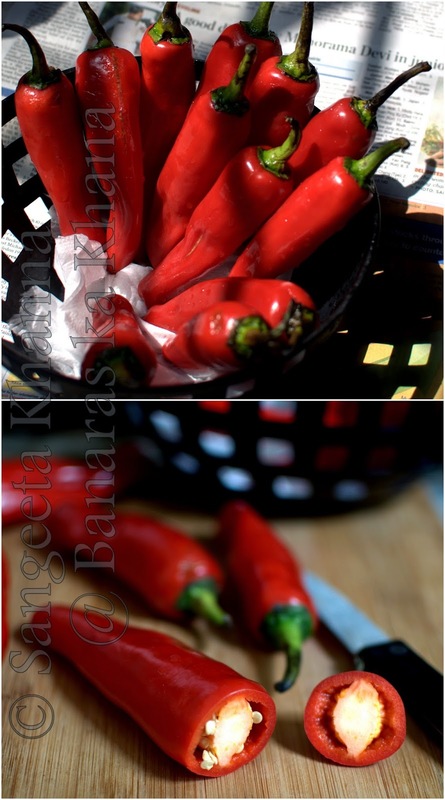 Laal mirch ka bharva achar or just call it bhari laal mirch. Almost everyone knows it what it is when you say bhari laal mirch in Banaras or any part of UP. Many pickle brands and small time pickle makers run a thriving business thanks to Bharva laal mirch. I have seen people getting this pickle packed in large quantities to be taken to different parts of the world. Such is the power of those familiar taste that you had sometime in your childhood. I have known a few people who would consume one large bharva laal mirch everyday. It is almost like ajinomoto in some people's lives. Addictive taste maker that it is. Although I am not among those people who would crave badly for this pickle, sometimes my mom used to send it to me and even that would get distributed to friends who liked it. But I had some wonderful lovely memories of making of this pickle at my parent's place. It was always prepared by my grandmother and she would call me to sit by her and sometimes help her stuffing these red chilies. I used to wear surgical gloves while stuffing these and used to wonder how my daadi's hands never burned by the chilly heat. And now after so many years my hands have seen many moons, many chores and they burn no more. Of course I take care not to touch the innards of any chilies. If I touch my face or eyes it is a different story altogether. Daadi would make stuffing equipment by cutting Neem ka datun (Neem sticks used as a toothbrush) neatly and would use it as a pressing instrument to push all the spice mix inside the hollow of red chilies. We shared many stories stuffing those laal mirch. I know about my grandfather only due to such chit chat with my daadi. Her hands would do the work deftly while she would keep on talking about the British raj and how the Angrez (Englishmen) ruled and destroyed. Both my grandparents were freedom fighters, grandfather couldn't see a free India in his lifetime. But that is another story. 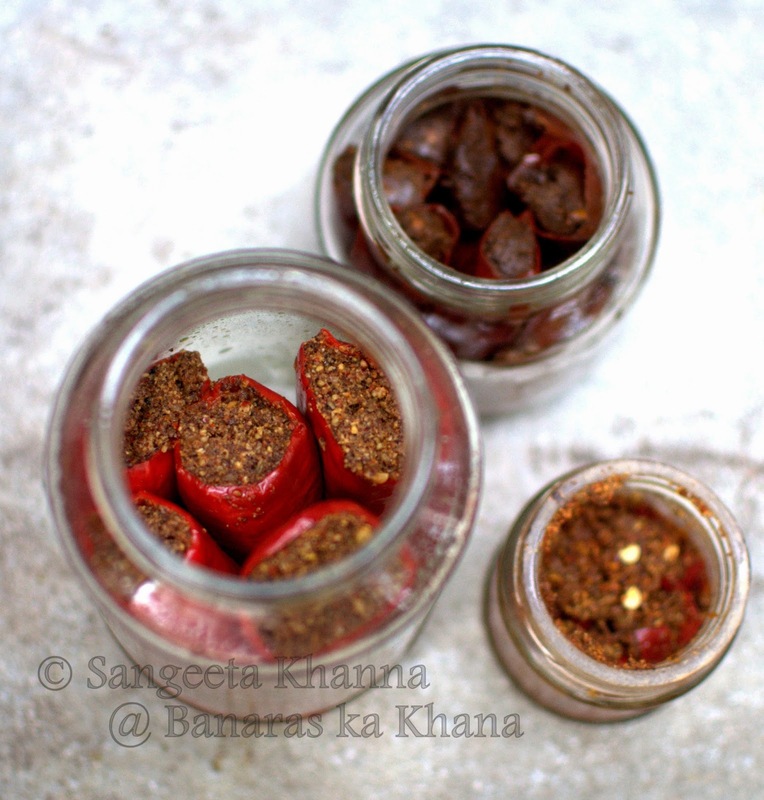 This laal mirch ka achar was a long due recipe to be posted here and I had bought these chilies a few times this season, but making Orange chilly marmalade came into picture and then I made another jam with Tamarind and this chilly. Both these were made repeatedly this season to gift them away as well. Lastly, when I suspected these chilies will be off from the markets this season, I decided to call my mom to ask for the spice ratio to confirm what was on my mind. Made the pickle in the next hour and called her in the evening to tell her how lovely it is smelling, just like daadi used to make it. I pickled only 5 large red chilies as we don't eat pickles much and I did not have much time to stuff many chilies. It took me only 30 minutes including clicking the pictures. Multiply the recipe if using more chilies but the amount of the masala used depends on how large and fat the chilies are. So go by your 'eyeballing the ingredients' experience and use the extra spice mix for a mixed up pickle like I have told in the end. 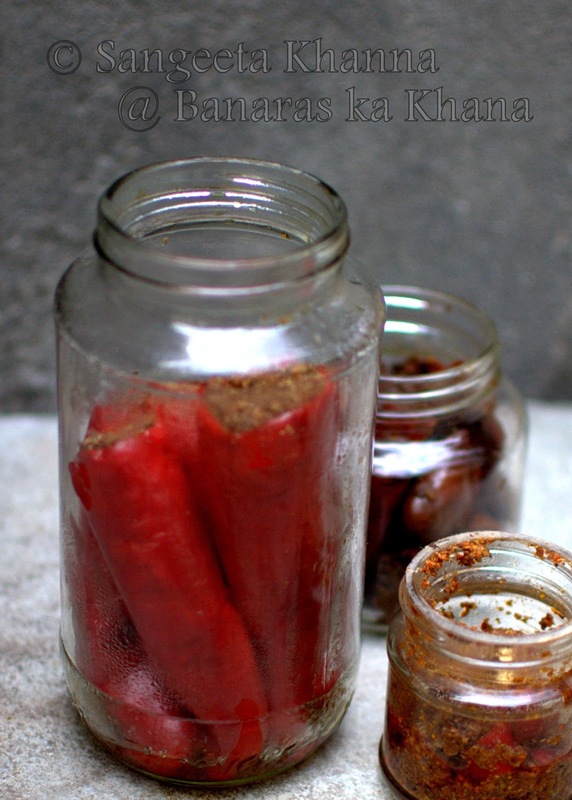 A clean sterilized glass jar that can hold the chilies arranged vertically. 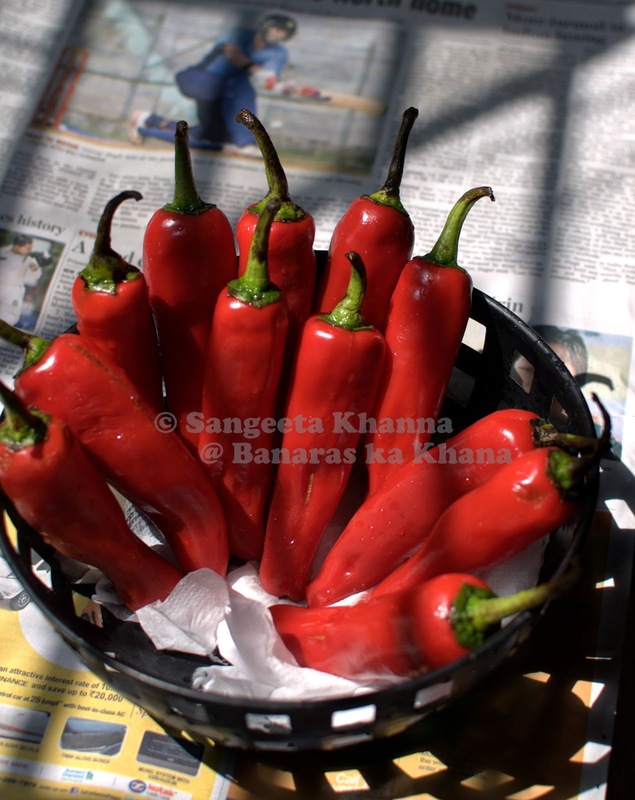 Get the lightweight for it's size chilies as those will have lesser seeds and the seeds would come out easily. It the chilies are tightly packed with seeds it will be tough to remove the seeds and the chilies may get damaged during hollowing them. But if you don't get such hollow chilies, you can always make the mixed up chilly pickle suggested in the end of this post. First wash the chilies well and let them get dry. I kept them in sun for about 15 minutes, lining the basket with tissue paper. Cut off the crown of the chilly, discarding the green stalk and some of the red part to make a smooth round opening at the top. Using a sharp pointed knife hollow out the innards of the chilies, including all the seeds. Wear surgical gloves or kitchen gloves if your skin is sensitive to chilies. Now make a coarse powder of all the other ingredients except the oil. 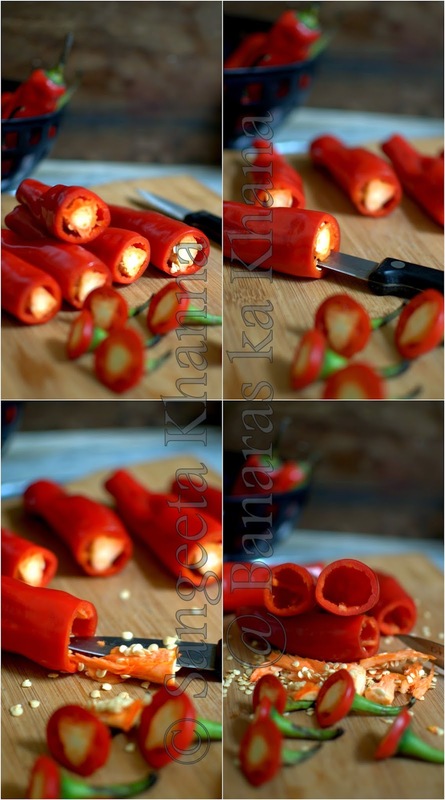 Chop off the bits of red chilly clinging to the green stalks and add to the grinding mixture. It makes the mixture moist and keeps it glued together. Add a tbsp of mustard oil when everything has been coarsely powdered and run the mixie or food processor once again for a couple of seconds. See how the ground mix looks like. Now stuff each chilly with the spice mix. I used a small spoon meant for weaning babies. The ones that come with baby feeders. Basically anything that can be used to press the spice mixture down into the chilies. 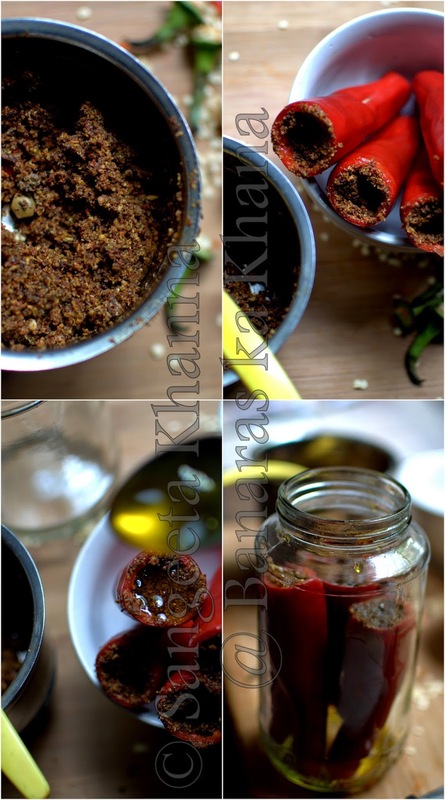 Drizzle mustard oil with the help of a spoon into each of the stuffed chilies. About a tsp of mustard oil goes into each one of them. Now is the time to arrange all of the chilies into the glass jar. Drizzle more mustard oil into each chilly if it can still hold some. Keep the jar in sun with lid on. You can drizzle some more oil into each chilly everyday, taking care not to spill any oil outside as that oil wouldn't help the pickle in any way. Some people like to fill the jar with mustard oil to drown all the stuffed chilies, I find it a wasting activity as this oil wont be used for anything if you don't make Litti chokha frequently. This pickle is used in the masala of Litti chokha and some people like this oil too into the spice mix made for Litti chokha. Here is a picture of my mom's red chilly pickle of the last year, that has turned a deep shade of red, the top one in the picture. The freshly made pickle is bright red. Smelling awesome and reminding me of my daadi, left side one. In the small jar on the bottom right, you can see the mixed chilly pickle. Mixed as in all the spices and chopped red chilly is mixed and put up into the jar. See how it is done. All mixed up and drizzled with mustard oil and then filled into a small jar. You can always chop and add some green chilly to the same spice mix if you wish. Pictures tell the whole story. We tasted this mixed one today and loved it. This mixed pickle is ready within 3 days while the stuffed one would take some time when it can be broken easily and enjoyed the way it was done back home many years ago. The skin of the chilly becomes softer so you can break off a half inch piece from top of the chilly and have with a meal. That's how it is normally served. One whole stuffed chilly pickle is broken into half inch or bigger pieces and served individually. That's why it is sensible to make a little of this mixed chilly pickle as well so you can taste it after 2-3 days. Best with daal chawal meals. Some people use it to mix in alu paratha stuffing, Sattu paratha stuffing or even with matthhis. I have seen some people having it with Thekua in Bihar. Ah yes, this pickle is as common in Bihar as it is in UP. A shared inheritance. I felt so good making this pickle that eating it with my meals will be special now. I know my daadi will visit me from heavens whenever I'll have it. The pickle has a shelf life of a couple of years. Please do let me know if you make this pickle. It is special. Sangeetha this is a special pickle! I have a stock which is more than a couple of years. It is kept in a sealed container in the fridge! This is my 'to-do-recipe' for the summer. Hopefully we will have a good batch of summer produce! this is my favorite pickle. i can never forget the taste when i first had them. have bookmarked to try the recipe. 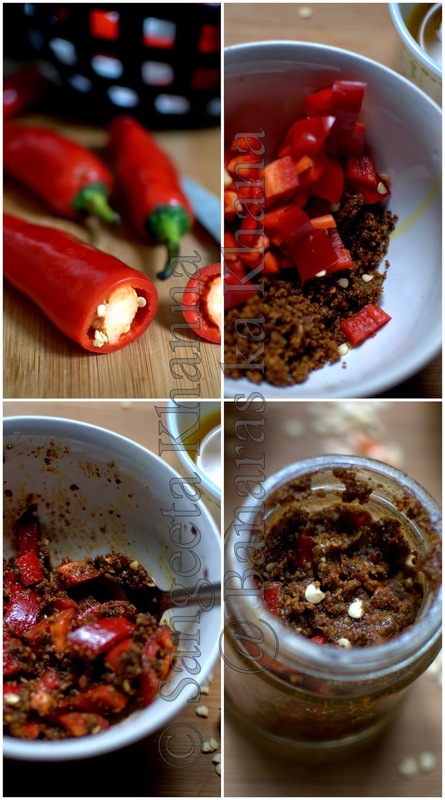 wow....looks mouthwatering...just delicious!i am looking for this recipe...thanks for sharing dear..
You are a mind reader - I was just thinking about this achar the other day! The recipes I have contain a lot of oil, which is fine but much messier to prepare. This looks easy. If laal mirch are still available in the sabzi mandi (there were a lot a few weeks ago, but cannot recall if they are still there) I will definitely make it. I made it yesterday, it is sitting in the sun right now. Doubling the masala made far too much, I could have easily done it with the quantities as stated! Nevermind, the leftover masala is actually quite good to sprinkle in a fairly plain sabzi, as long as you watch out for salt (since there is plenty in the masala). I cannot wait until they are ready! oh..so drizzling oil over the chillies is enough. I was told to dip the stuffed mirch in a bowl of mustard oil so as to coat it completely with oil......just one dip and out.... Earlier I had just stuffed the filling and let it be. The pickle had turned out to be very leathery and dehydrated :( But drizzing is the best solution. Mouth watering stuff...brought back a lot of memories of our days in Allahabad. How I love this pickle. Seems easy to make. Let me think about doing it. Is mustard oil a must or can another oil like olive or sesame be used? Mustard oil is the best for this pickle. Though you can use Olive oil or Sesame oil. Masala is awesome, flavour is mouth watering, taste stays in mouth even after food is finished, just irresistible... A little of my masala was left , so i mixed few green chilli cut into small pieces in it which turned out more demanding in our house. Thanq so much for sharing ur family recipe.i will do dry it.pl. Clarify my two queries. mustard oil is to be used as itis or we have to put on heat till smoking hot then wait for cooling as we do in other pickles. 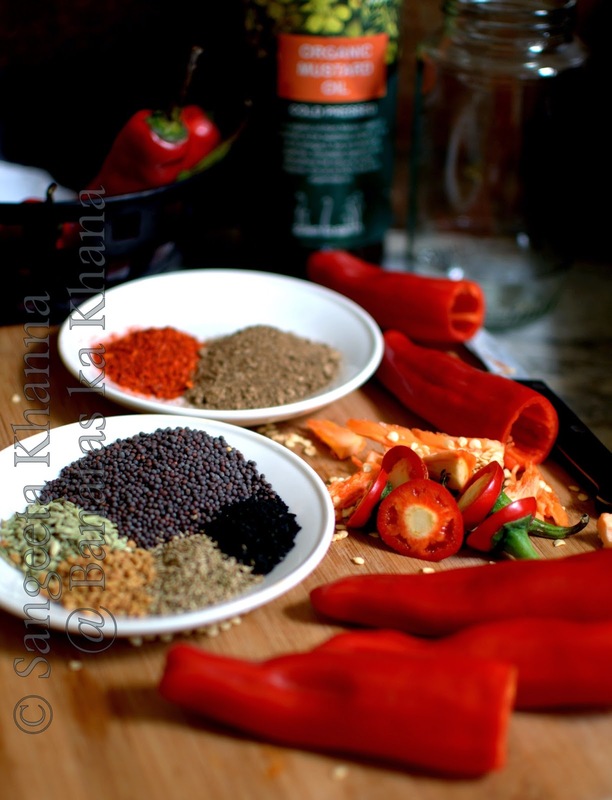 should we discard all inner part of chilli or can be used in spices to be filled in chili. Thanks for sharing the recipe. Loved the taste . I think you need to empty a little masala from each chilli and fill some oil in them to make it softer. 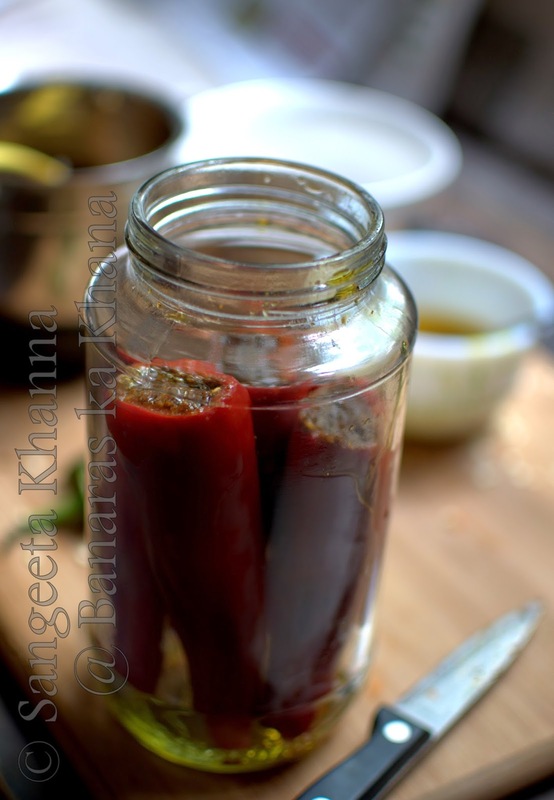 My mother in law used to make this pickle and push the masala with the back of a knitting needle! I am glad you liked this stuffed red chilli pickle. Can we use raw mustard oil or do I have to cook the oil first? I remember my mom use to cook mustard oil before using it for the pickles. you can use raw or cooked mustard oil as per choice Payal. This Bharwa mirch ka achar responds well to both ways. Tried this recipe..... Just want to thank you from the bottom of my heart. It turned out amazingly awesome. Thanks once again. I have tried the recipee twice as you suggested and it turned out awesome! Thanks for sharing this and such detailed description. Everybody in my family loves it.